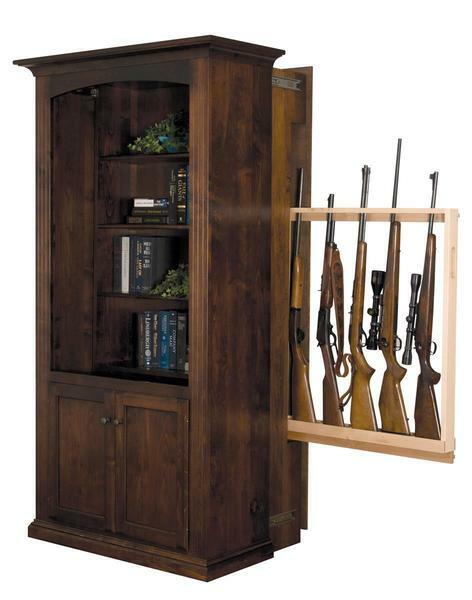 Keep your firearms close by and easily accessible, while staying safely concealed on the hidden gun rack behind the shelves of this beautifully handcrafted bookcase. The bookcase by itself is a gorgeous piece of American made carpentry, but when you reveal the pull-out secret gun compartment, it adds a whole new level of cool to this bookcase gun cabinet. With a perfectly crafted outer shell that pulls forward on smooth drawer slides to reveal a pull-out gun rack, you will never know this secret compartment exists without seeing it with your own eyes. This unique design was carefully crafted as the first of it's kind to make sure there were no seems or gaps to give away the gun cabinet hiding behind these solid wood bookshelves. For further safety, a secure lock is added in a concealed area behind the top molding to keep the outer shell locked in place. This will restrict access to your firearms so that children or any unauthorized individuals that know about the hidden gun cabinet won't access it without your permission. Create a custom look by selecting the wood and finish of your choice from a variety of options available with this one-of-a-kind Patriot Bookcase Gun Cabinet. Contact one of our knowledgeable furniture specialists for additional information or ordering assistance. Maximum Gun Length: 47 1/2"